[*Fix] Lenovo A6000 Plus WhatsApp Contacts Sync Problem after Lollipop 5.0.2 Update : The trending Lenovo series got Lollipop update i.e.,Lollipop 5.0.2 just two days back. The interface as expected is perfectly working and everything is good from the perspective of OS side too. But the thing is if you observe, there is WhatsApp Sync issue and it shows only Phone/Mobile numbers without contact names in the call log. In WhatsApp Messenger , you see a notification like “None of your friends are using WhatsApp, Invite them” and it won’t show any contacts. This is the issue you get if you update your Lenovo A6000 plus with Lollipop 5.0.2. Here is the detailed procedure to fix the Contacts Sync issue in WhatsApp and call logs after updating your Lenovo A6000 plus with Lollipop 5.0.2 or other Lollipop updates like 5.0 or 5.0.1 or next upcoming updates like Lollipop 5.1 or 5.2. ♦Must Know: Simple Steps to Use WhatsApp Without SIM & WhatsApp Web Version for iOS. Do back up of your data and contacts to your SD card. Have exactly around 1 GB of 3G data in order to install all the apps after Factory Reset. Friends, These are the steps which i checked in my personal Lenovo A6000 Plus WhatsApp account. 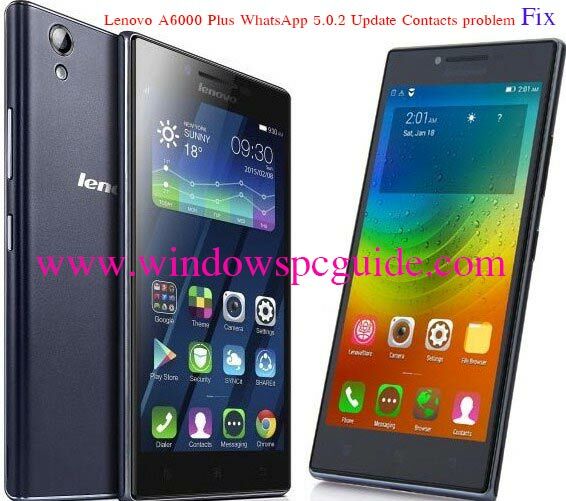 So, Don’t worry be with me till the end of this peculiar guide to fix WhatsApp 5.0.2 Update glitches in your Lenovo A6000 Plus(+). These are very simple tips/tricks to fix this latest whatsapp update notification issue in contacts of our favorite Lenovo A6000 Plus mobile/phone. ♦ Flash Update : WhatsApp Video Calling Steps Guide & Download Latest Apk for Video Calling. Go to settings and choose Backup and Reset to check whether Backup my data and Automatic Restore options were enabled or not. If not enabled, enable them. Go to Contacts manager option of Lenovo A6000, choose options and then Import/Export to export your contacts to your SD card only as Factory Reset option erases everything if you export them to your phone memory. Go to settings and choose Factory Reset option. In few minutes, everything in your internal phone memory gets erased and reboots. Then it shows a message that the Backup of your data is found and asks whether you want to restore it or not. If you check once now, your issue got fixed although your Lenovo A6000 Plus still contains Lollipop 5.0.2. Then import your contacts from your SD card. That’s it. If you have any doubt’s any point of time while fixing whatsapp contacts issue in Lenovo A6000 Plus Shoot out your comments in the comments section. We will give reply within few minutes. My dear friend, I think Surely you will fix it with ease. ♦ Check it : WhatsApp Web on Edge Browser & WhatsApp Messenger for Samsung Users. There are some bugs in android Lollipop 5.0 version. In order to overcome these, Lollipop 5.0.1 version has got released by Google. By upgrading to Lollipop 5.0.1, most of the bugs got fixed but still some were there. To fix them, Google has released another new version Lollipop 5.0.2, the upgraded version for now. If your phone is not performing well and becoming slow frequently, you need to upgrade your smartphone so that you can improve its performance. There may arise issues with your battery and WiFi to the higher version of android. For battery problems: You can get rid of this by going to play store, finding out the apps that need updates and installing them. For WiFi problems: If you find the problem of connecting to WiFi, just make your smartphone forget the network and reconnect it. Guy’s Please this article as fast as possible. Because lot Lenovo users updated to latest wonder android lollipop 5.0.2. So, They all are eagerly waiting for your share. I think this tricks is enough to fix Lenovo A6000 plus contacts sync issue after updating to Android KitKat 4.4.2 to Lollipop 5.0.2 Version. Finally Thanks for reading and thanks in advance for your sharing this awesome guide on Social media. Hi I have a different issue. I have some contacts saved and exported from phone. When I import contacts from saved file it shows all unique contacts, when I refresh contacts in whatsapp, it shows contacts there but when I see it from contacts, it shows duplicate entries – while trying to edit, one of them shows phone contact and other shows whatsapp contact. Is there a way to have them merged as they were in earlier android version? Most Welcome Sudheer. Keep Visiting for more updates. Thank You 🙂 . i have problem with lenovo A6000 5.0.2 lollipop i cannot access my wifi connectivity? can you give me solution with this problem. I am using A6000 model. I have updated to lolypop version 5.0.2 from KitKat 4.4.4. Now my phone is not performing as like before. It keeps on hanging and become very slow. I have done factors reset but still no improvement. Always get the error that launcher not responding. I just want to restore the old version of android KitKat 4.4.4. Please help.